Jacob breaks down Daniel Ochefu, a 6-11 senior center for the Villanova Wildcats. 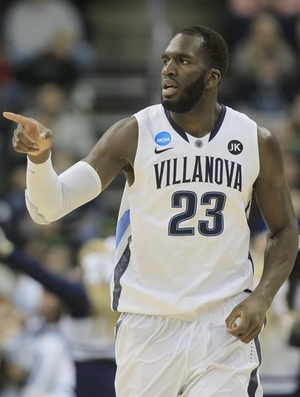 Now returning for his senior season, Ochefu hopes to put last season’s disappointing exit behind him and help a reloaded Villanova squad return to elite positioning in the Big East. Long and with a superb motor, Ochefu in in many ways fits the mold of the NBA’s new wave of defensive minded centers who are agile enough to clean the glass, while maintaining strong rim protection inside. At 6-11, and with a 7-3 wingspan, Ochefu is perfectly sized to play center in the NBA. He may be a bit slender at 245 pounds, and isn’t the most explosive big man around, but few big men at the college level play harder than he does. Ochefu has big hands and is generally comfortable catching low entry feeds on the offensive end, although he’s not immune to bobbling the occasional pass. He is extremely limited spatially on the offensive end, however, attempting just four shots away from the hoop all season. With that being said, he’s capable of finishing offensively thanks to his excellent length, and has improved his footwork and ability to operate with his back to the basket substantially in the past few years– an interesting nugget of versatility for a defensive-minded player. Although he’s relatively agile for a big man and as long as they come in the Big East, just 3.8% of Ochefu’s offensive possessions came in transition. Ochefu’s incredibly short strides and poor flexibility make it difficult for him to beat opposing big men down the court, and he does not always quite have the coordination needed to catch the ball running in full stride, often being called for travelling violations, even though he’s improved substantially in this area over the last few years. All but a handful of Ochefu’s possessions came around the basket on offense last season. And while he’s not particularly graceful, and very right hand-dominant, he’s developed his touch around the hoop quite a bit, shooting 124-for-190 (65.2%) on the season on half-court looks inside the paint. Though Ochefu is extremely efficient on field goal opportunities, his overall offensive efficiency is reduced by his tendency to overstep his responsibilities in an effort to become a playmaker in the offense. To his credit, he identifies his targets on the court exceptionally well for a big man – lending to the idea that he could potentially help facilitate an offense from the post (for the season, Villanova teammates shot 15-for-27 on three pointers that were attempted directly off of Ochefu double-team pass outs from the post. Still, Ochefu’s passing ability needs considerable work. He rarely hits his targets in their shooting pocket and tends to throw his passes from his stomach, which both telegraphs the pass and makes it deflectable for shorter defenders. Ochefu’s passes were intercepted, deflected, or just sailed out bounds on a somewhat regular basis. He turned the ball over on 21.3% of his possessions and sported a 0.83 Assist to Turnover ratio. Ochefu is a phenomenal rebounder, as evidenced by his 14.1 rebounds per-40 minutes. He grabbed 21.4% of all available rebounds when he was on the floor last season, ranking him fourth among all NCAA Seniors in that category and he was responsible for about 25% of Villanova’s total rebounds for the year. This will definitely be his calling card as a NBA prospect, and one he can definitely hang his hat on moving forward. Ochefu was a mediocre rebounder as a freshman (9.3 per-40), and improved quite a bit between his sophomore (11.1) and junior seasons, showing just how much his coordination and awareness has gotten better since arriving on campus. Once extremely foul prone, Ochefu has made significant strides on the defensive end and had some very impressive moments at times last year. His combination of length, energy and a rapidly improving basketball IQ can make him a real difference maker at the college level on this end of the floor. Still, he’ll have to improve his flexibility and also get significantly stronger in the lower body, as it’s not rare to see him giving up deep post position and backed down by stronger players. Overall, it will be an important year for Ochefu to demonstrate progress offensively. A 21.8% turnover rate simply will not cut it in the NBA for a big man. With his size, length and above average mobility, he’s got all the physical tools to take his talents to the NBA. Scouts will want to see just how much more he still has to develop, as he’s made some huge strides since arriving at Villanova, and another big jumper as a senior could put him firmly on their radar screens.